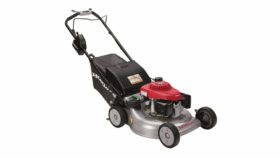 Honda HRR216K10VYA lawn mower- This top performing homeowner Honda mower is designed for cutting efficiency. In addition to the Smart Drive variable speed control, it has a blade brake clutch that allows you to start & stop blades with the engine still running. 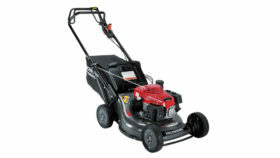 Powered by a reliable Honda GCV160 engine, this mower has twin blades, 6 position cutting height adjustments (1-1/8″ – 4″), and a 1.9 Bushel Bag. The 3 in 1 system allows you to switch from mulching to bagging or discharge with just one touch. The 2-Position handle makes it easy for storage.